Vriti Jatia’s label is for those who love their cottons. Started six years ago in Pune, she has recently moved to Mumbai and set up her workshop in Lower Parel which also has a small unit that displays her classic pieces for you to go check out and buy. She designs all her clothes herself and is often seen fusing textures and patterns to make statement pieces that are bound to add an edge to your wardrobe. They emphasise more on cottonwear, as that sells more for them given the summer-wear requirement throughout the year in this humid city of Mumbai. Starting at INR 4,000 their cotton wear includes embroidered tops with interesting cuts, jumpsuits, dresses in single colours, and kurta-palazzo combinations. All their material is hand woven and hand embroidered giving it the authentic touch most labels miss out on. Closer to festivals, they also do a premium range of Indo-western wear which is more formal and festive. 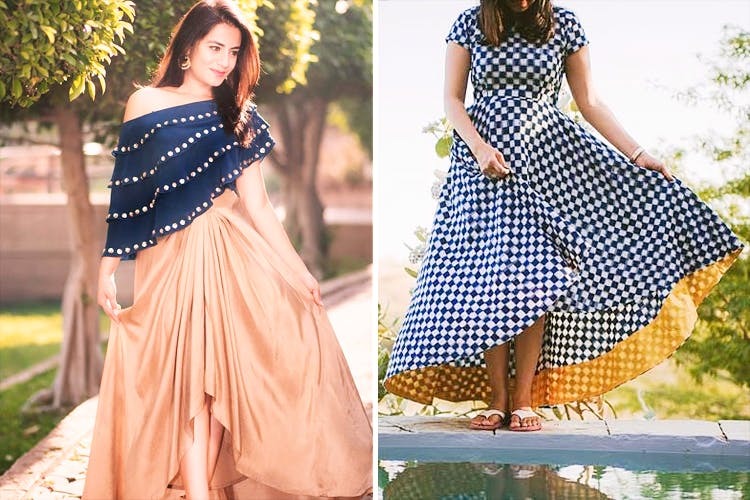 This range starts at INR 8,500 and includes dhotis, ponchos, short kurtis, and even sarees made of pure fabrics life crepe, dupion crepe, organza and georgette. What differentiates Vriti’s clothes from most other brands are the interesting cuts and designs which are all her own doing. You will find her label at all the leading exhibitions and shows. While you can head to Lower Parel to check out her collection in person, you can also go through it on her Instagram and Facebook pages. For your ease, DM her to know individual prices and even to place your order. Let every day be just as special as any other day with Vriti’s contemporary fusion wear that will add an edge to your wardrobe without compromising with comfort.